MOSCOW, the Russian Federation, (BulgarianMilitary.com) – According to the thematic bulletin of the Russian Ministry of Defence, currently, a new advanced gun system is being under development in Russia, which to be designed for tanks that are based on the Armata heavy military tracked vehicle platform. Sputnik News reported the information yesterday (5th February), citing the the Missile-Technical and Artillery-Technical Support of the Russian Armed Forces-2018 bulletin, learned BulgarianMilitary.com. The bulletin of Russia’s Defence Ministry says that the weapons of the tanks manufactured in Russia are based on a 125-mm smoothbore cannon and in the past 40 years, a number of different changes have been made to this armament as part of its modernization process. The upgrade aimed to boost the technical and tactical characteristics of this piece of hardware. The statement reveals that, at the moment, a new gun that features increased energy efficiency is being developed for the prospective Armata tank. At the end of December last year, the Russian Defence Ministry announced that the T-14 tank developed for the Russian Ground Forces on the basis of the universal Armata platform, was completing the factory trials and the start of its state trials was planned for 2019. The T-14 features an unmanned remote-controlled turret and an armored capsule that is used for protection of the crew. Its armament includes a 7.62-mm remote-controlled and a 12.7 mm anti-aircraft machine guns, as well as an auto-loading A82 125-mm smooth-bore gun that is the main weapon of the tank. Earlier, it was reported that a more powerful 152 mm cannon would replace the 125-millimeter variant in later modifications, although in this way, the ammunition capacity of the T-14s would be reduced. The new main gun will feature and the capability of firing anti-tank guided weapons. The tank is also equipped with the advanced Afganit APS and Malachit reactive armor modules. 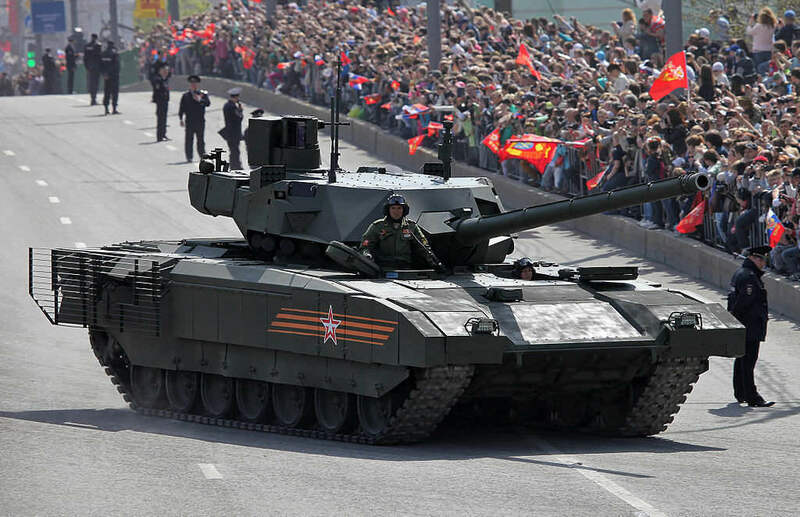 The universal chassis system Armata is also a platform for more than dozen different tracked armored vehicles, including an armored military engineering vehicle and a self-propelled artillery howitzer. Read more: Is Small Beautiful For The Army’s Next Generation Combat Vehicle? Last August, at the the international defence forum Army-2018, Russia’s Ministry of Defence concluded a deal on the purchase of 132 next generation T-14 battle tanks and T-15 heavy infantry fighting vehicles based on the Armata military tracked vehicle platform. It is expected the deal to be fully implemented by late 2021.